Security forces have blocked all roads 8 baseplates from the prison. Dozens of officers from the Empire Police have been deployed across East Davidium after this morning’s confirmed escape of the country’s most infamous crime boss, former Hole Heads head Pol Cardha. Prison officials admitted this morning that ‘El Plato’ escaped Davidium’s Maximum Security Prison in a refuse collection vehicle and a number of prison guards are being investigated for possible collusion with the escape. Roadblocks have been set-up on all roads that lead to the prison and air support is being provided by the military. 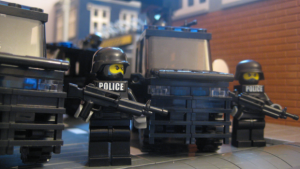 Prime Minister Robert Goldman told the Hall of Minifigs that the state would not hold back to capture Legoland’s once again most wanted fugitive. The jail break comes at an inopportune time for the new administration as the capital is increasingly gripped by a turf war between organised crime syndicates. According to PwP security analyst Murdoch Vickery, the NBO’s honeymoon period is definitively over. In November 2013 Pol Cardha was apprehended after armed police backed up by the army raided a warehouse in East Davidium. 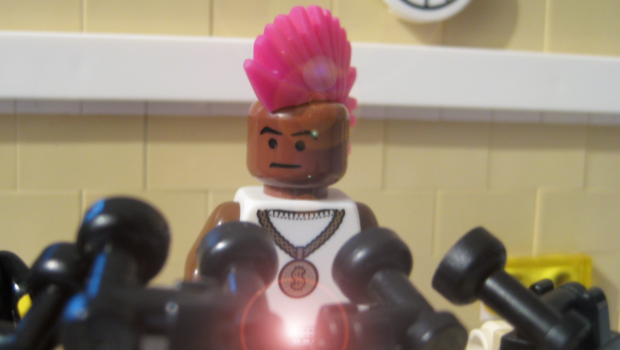 The minifig was subsequently sentenced to 15 life terms (450 years) by a secret judicial court. Although never publicly named, 3 of the 5 judges of the court that convicted Cardha were assassinated in the following years. 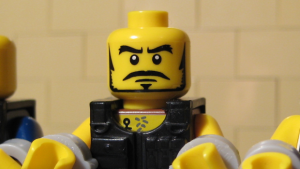 Under El Plato the Hole Heads established a significant drug importation operation with Gardinian cocaine producers which saw the crime gang become the country’s second most powerful criminal enterprise after the Legoland Mafia.